Not only are Baby Chilli Modern Cloth Nappies a fun and exciting way to spice up your baby’s behind, but they also reduce your footprint on the environment an SAVE YOU MONEY! They ar as simple to put on as a disposable but also have the added ‘cuteness’ factor. 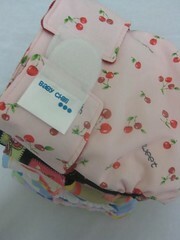 They are also more breathable so can assist with nappy rash and also feel more comfortable on bub. Every year billions of disposable nappies make their way into landfill, taking hundreds of years to decompose. MCN’s are reusable and while the initial outlay for them can seem large, over the life of just one child in nappies the savings become very obvious, factor in subsequent children and the savings are HUGE. You can also say goodbye to rushing to the shops for a late night nappy pick up as you have run out. To use MCN’s full time you will need around 18-24 which is 6-8 per day with time for drying.